Seaweed in a little pool of water on a rock at Halibut Point State Park. As a kid, I loved to play in these little pools to uncover rocks and see if there were any interesting creatures under there--crabs, hermit crabs, snails, whatever I could find. I was less interested in the seaweed--it was just weird slimy stuff. But when I look at this little pool with its bright green seaweed floating about, I'm more intrigued by the seaweed than I used to be. 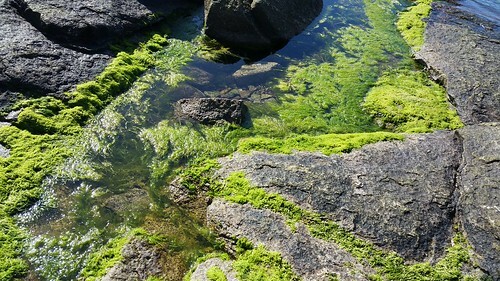 Maybe it's because I've found seaweed to be reasonably tasty when cooked or just because here at Halibut Point State Park where I took the photo, it was so vibrantly green compared to the dark green seaweed I was used to growing up. That also makes me wonder what causes such a different in the shades of green. My limited scientific knowledge would lend me to think that thsi green gets a lot more direct sunlight than the dark seaweed and therefore doesn't need to draw in as much energy. But I could (and am likely) entirely wrong on that point.